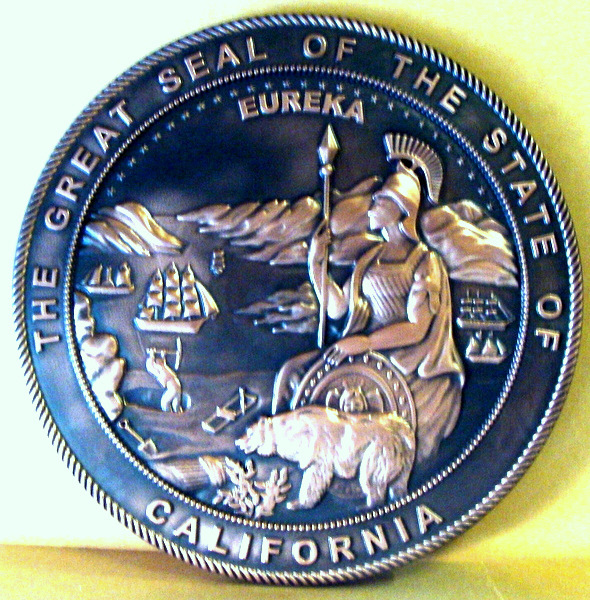 Above is shown a copper-coated 3D carved High-Density-Urethane (HDU) California Great seal .The text and art is copper-coated, with a high polish, and the background is copper-coated with very dark unpolished patina. This seal is 24 inches in diameter, but can be purchased in any size from 16 inches to 60 inches in diameter,It can also be customized with other text. surface choices, which are shown in the top row of Gallery 32. Please click on Product Gallery 7 to see 100 other bronze, brass, copper, gold, silver, nickel-silver (German silver), stainless steel and department, agency or other organization of the US Federal, State, county and city governments and aluminum plaques and signs. We make custom & personalized copper-coated round, rectangular, shield, and other shape wall plaques of all of the great seals, emblems, logos, badges, medals, insignia, and patches for any branch, their various departments, agencies, etc., (especially courts), as well as professional offices (attorneys, doctors, CPAs, etc. ), colleges, companies, stores, cemeteries, memorials, churches, and residences. The surface of a plaque or sign can also be finished in combination of metal coatings/gilding/paint and full color paint or a variety of natural wood finishes (see M7000 to M7000C and M7202 in this Gallery 7). Most of the plaques in this Gallery can use this wide selection of color and surface finish choices.